This is taken from my blog. I thought it would be enjoyable to put it here. Please call me Seti. A character never outranks its author, and I am a character that you created, based on a man in history. We are not the same, and Mourningtide is not a textbook. You diverge from what is known in one or two regards, but you do cover those episodes in an afterword, do you not? I certainly do. Well…Seti… I thought it would be interesting to speak with you about the events that are covered in Mourningtide. I was named for my grandfather, who was a troop commander in the Royal Army. I came from a non-royal family that had spent generations in the armies. We did have some wealth, and ours was a position of increasing influence. By the time of the book - according to the reality of the book - I had succeeded my father, who had been named by Horemheb as his successor, and had ruled for a year. At the opening of the story, I had been King three years. Two of those years had been spent on campaign, winning back territory and allies Egypt had lost. I was in my early fifties with four children - two sons and two daughters - and six grandchildren, with two due to arrive at any moment. And you were expecting a prosperous reign? I was hoping for one. I was ready to do what I could to achieve it for my people. And your son died through an accident. Don't be. He disregarded the warnings of another, more experienced man, walked into a dangerous situation with his eyes wide open, and was killed. It happens, as we both know. I was overset for a time, and Mourningtide tells the story of my healing. You have chapters up for review on your site. Did you wish to go over the story itself? Or did you want to chat about other things? Let's chat about other things. This is not your first appearance in one of my stories. No, it is not. My very first appearance in something of yours was a mention, almost in passing, in Pharaoh's Son. 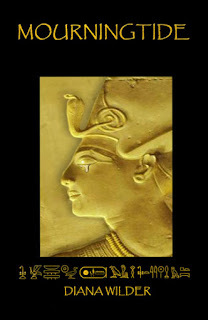 Prince Thutmose entrusted me with a secret which I, in turn, entrusted to Ramesses as I was dying. His Highness the High Priest had some very kind things to say about me. My second appearance was in The City of Refuge. In that story I led a division of the Army of Lower Egypt that served as guards and laborers for Lord Nebamun's mission to Akhenaten's capital city. My father and Lord Nebamun were good friends. I knew nothing of this at that time. You had quite a large part in that story, didn’t' you? It was large enough. I was considered a major character. Enough happened to make it clear that Lord Nebamun - the hero of that story, along with my good friend Khonsu - was capable of running rings around anyone who came up against him. I was thoroughly embarrassed, though I did mean well. Reading over the book, I found myself laughing. I enjoyed writing the book. Did you have to have me locked in an escape-proof courtyard on a stormy night? Let me ask you: will I be appearing in any other stories of yours? You appear as a memory several times in Kadesh. As to other stories with you as a living person... I don't know. Your conflict was handled in Mourningtide. There may be other stories, I can't say. But not now. Kealakakua. Angkor Wat. If we are speaking of strange or unpronounceable place names, they might fit. Or, to go 'across the pond' as you Americans and British say it, how about 'Worcestershire' - spelled 'Wore SES ter Shyre' and pronounced 'Woostersheer'. Or Llanfairpwllgwyngyllgogerychwyrndrobwll-llantysiliogogogoch (or Llanfairpwllgwyngyll) That may be cheating, perhaps, since the name is a sentence describing the location, but it is on the maps. Looking at it syllable by syllable, I can pronounce it. Try Pontchartrain. Neuschwanstein… How are they worse than 'Waset' or 'Men-Nefer' or 'Iunu'? Those who read fantasy books have no problem with 'Gormenghast', 'Minas Ithil', the Baranduin, or Dol Amroth. Prince Imrahil is one of my favorite characters, but his name is no easier to pronounce than my son's. And added to my objections is the fact that modern society does not know how my language sounded. Like the Hebrew writings, we did not supply vowels. I see your point. But some of the Egyptian names can be difficult. Like Amunhorkhepechef. Be careful: you are meeting yourself coming. You said that name was easy to type. And you know better. It is a ceremonial name that means 'Amun Mighty in Battle'. Your own sources have indicated that that name was altered depending on what city was home for that prince at any given time, so that if he was residing in Iunu (Heliopolis, if you wish), he would have signed his name 'Rahorkhepechef', and if in Khemnu (Hermopolis, if you are not a purist) he would have been Tothorkpehechef or Thuthorkhepechef. You were right to give him the nickname 'Hori', by the way. That's what they called him. Speaking as an experienced father, a person's name must be something an angry parent can yell at the top of his lungs while running after a naughty child. Amunhorkhepechef does not satisfy that requirement. Ergo, it was not the boy's actual name. It is as silly as someone thinking that Her Majesty Queen Elizabeth of England - may God bless her! - answers to 'Defender of the Faith' when that title is used by a grandchild at the dinner table. Good point. Do you have anything else to say on the subject of language difficulties? Yes. A Elbereth, Gilthoniel! Silvirin penna Miriel- You are laughing! The problem with that perception is that all they know of my era… or, let us say, 85%, comes from tombs and the items taken from them. I wonder how archaeologists of the future might view North Americans and western Europeans if their only source of information is what they find in Forest Lawn Cemetery or Westminster Abbey. 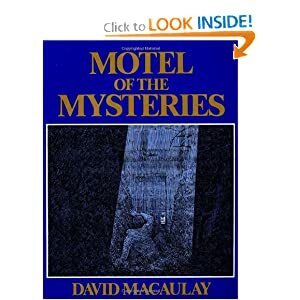 In fact, there is a hilarious book by David Macauley with the title Motel of the Mysteries that explores what future archaeologists think of a dig in North America. Their interpretations are very amusing - and they are in line with the folly I see pertaining to my own culture. Tell me about the hero of your story. The hero? There were two. My son, Ramesses, is one - he showed himself to be like a bell that rings true no matter how you strike it - and Djedi, the young man of the small village that sheltered me. He saw a need to protect his town from attackers, and he set out to do so. I helped him as much as I could. They had no idea who you were. Correct. Lord Nebamun met some ghosts from his past through my inadvertent actions, but he won through, though he did give me a piece of his mind when I returned. But you were not the hero? I was the main character, the protagonist. I did experience hardship and change - but I was not heroic. You will have to agree. I did what I always did - though I did mourn the loss of my son. I had no heights to scale, and falling in love with a wonderful woman required no heroism on my part. No, Djedi was my hero - and Ramesses. Yes. How could I not? He needed to be coached, they needed to be protected, and I had the experience. And they were my subjects, after all. He became the man who would be 'Ramesses the Great'. That name is spoken with curled lips by some. It seems that a great man or woman is always the target of sneers. People seem to want to see them taken down, their reputations sullied - their clay feet in evidence. Ramesses was great. He ruled for nearly seventy years, and his rule made it possible for that part of the world to enjoy peace and stability in what truly was a golden age. Perhaps. But my reign was not long, and Ramesses stepped in and did his magnificent best. Poor lad. Yes. He is to be pitied. Think of it: he saw the deaths of all he loved. His four oldest sons - three of them serving as Crown Prince - died before him. Hori after thirty years, Rai - another Ramses - after another twenty-five, Khay (Khaemwaset - one of the heroes of 'Pharaoh's Son')- after another five, when he himself was old. He watched his children - the children of his youth and his loves - die one after another, themselves old men. And then he began to fail, himself. Those people who like to examine corpses and do DNA testing and x-rays have shown that Ramesses had arterial occlusions that probably led, late in life, to senility. There was, I know, a moment when he stood aghast and realized that he was failing, growing feeble… I was spared that. Don't be, Diana. There is nothing to weep over. All hurts are healed now, but we would do well to take that lesson with us. There. You are smiling again. What else do you wish to ask me? As a character in historical fiction, what is the one thing you would like to say. You make a good point. And I thank you for spending time with me. I assume you are going back..? Yes. To the place you left me this morning. The village is fighting off the attackers, Djedi leading under my eye. Does he know you are king? You are the author. You know already. And if I told, you would never let me forget it. Probably not. Thank you for stopping by and speaking with me.